The Nautica Queen also offers a “Sightseeing Only” option. 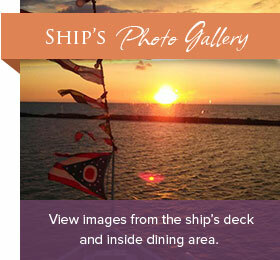 Enjoy the same great views and cruise without the meal (no food or beverages are included). Sightseeing availability is limited. Sightseeing is not available on Holidays or Special Event Cruises. The schedule is provided below. To make your reservations, call 216.696.8888 or book online now. Prices do not include sales tax (prices in parentheses do include sales tax). Please note that prices and schedules are subject to change without notice. Call for the latest rates, availability, and special event pricing. Parking is available in the FirstEnergy Powerhouse Parking lot. Parking prices can range from $3.00 – $10.00. The parking lot only accepts cash.